There are few drummers that polarise opinion as much as Lars Ulrich. Whatever you think of the Metallica sticksman, there's no denying that he has enjoyed monstrous success and played a pivotal role in the birth of thrash drumming. As the genre enjoys a resurgence (in no small part thanks to the recent big four Sonisphere shows, and our killer thrash drumming cover feature, of course) we've looked back on our favourite moments of the larger-than-life drummer's career. There are plenty of memorable moments in this seven-minute metal epic, but perhaps the most enduring, for us anyway, is the perfectly locked-in chugging guitar and ferocious machine gun double bass pedal triplets. Of course, there's also the shifts between time signatures (from 4/4 to 3/4 to 6/4 and finally 2/2) which make this a drum classic. Still widely regarded by many as Metallica's finest moment, 'Enter Sandman' has plenty of high points purely from Lars' point of view as well. Kicking off with a crescendo of toms before launching feet first into a driving beat and then back onto the toms, here he provides a solid base that the iconic track is layered on top of. It may be breathtakingly simple, but Lars' crash, tom, fill combination at the start of 'Sad But True' really lays down a marker for what's to come. Of course, what's to come is five minutes of head pounding metal. Lars keeps things simple as he trades his backbeat with Kirk Hammett's crunching riff. Check out this Jason Newstead-era live video of the track, just ignore Lars' skimpy shorts. Maybe he came straight from the tennis court. 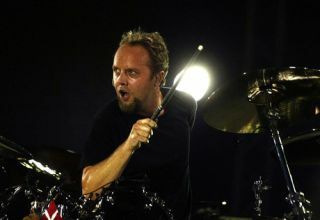 Sonically similar to being beaten around the head for eight minutes, 'Blackened' was an early indication of Lars' repertoire of metal drumming. From the intro snare slashes to the million-miles-a-minute pre-verse and post-chorus blasts and beyond, this one is an early Metallica classic that paved the way for what was to come of the next 20-odd years. After the disaster that was St Anger, Lars and the boys needed a strong return with 2008's Death Magnetic. Thankfully, Lars ditched the metal dustbin lid snare sound and Kirk Hammett whipped the guitar solos out of his back pocket. 'The Day That Never Comes' may be one of the more downbeat tracks of the album, but it's undoubtedly one of the strongest. The verse off-beat crashes, the snare-filled chorus, the upbeat rock steady solo section, it all combines to make a 21st Century Lars classic. For more on thrash drumming and the big four, pick up the latest issue of Rhythm.